Patience is a virtue when it leads to good judgement. Last week, this kind of patience was on full display as Federal Reserve Chairman, Jerome Powell, delivered a dovish outlook on monetary policy. The more hawkish message of last summer and early fall is now gone, and rightly so given trends in the data since then. Specifically, a sharp spike in market volatility last fall, and clear signs of slowing global growth, has led to this moment. Ongoing Chinese trade and Brexit negotiations also compelled the change in attitude. We are happy to see the Federal Reserve is reacting this way in the face of growing evidence of weaker global growth. 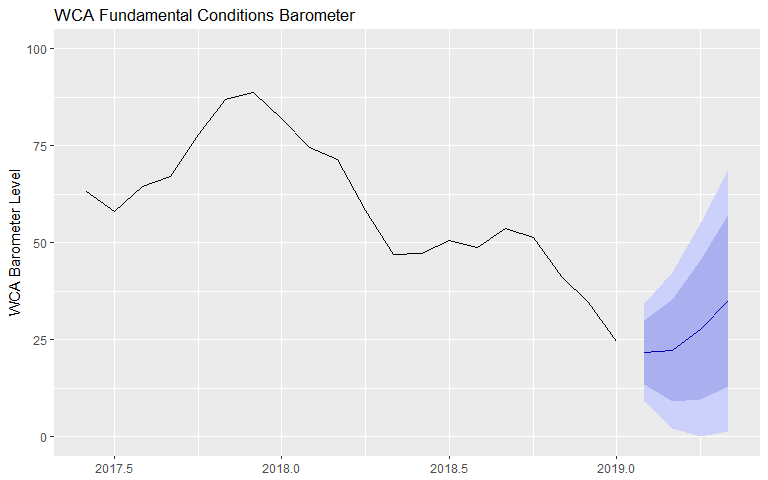 As the chart below shows, our WCA Fundamental Conditions Barometer weakened throughout 2018 and into 2019. Sustained changes across a wide array of data, measured over weeks and months, are to blame. The weakness is most acute overseas and in the area of financial conditions. Countries including Australia, Canada, France, Germany, Italy, Japan, Korea, China, and India are all exhibiting some form of weakening outlook. The United States has been immune from most of the pain, but weakness overseas could impact our economy given enough time. Multinational firms, which make up the majority of our equity markets are already feeling the pinch from a weaker global economy. According to FactSet, first quarter earnings are now expected to be negative for S&P 500 companies, most of which are multinationals. Anecdotal evidence during fourth quarter conference calls also seemed to point to rising pressures overseas. While the market is cheering the continuation of easy monetary conditions, we remain cautious. Early last year, markets began to signal concern. First, the Treasury yield curve flattened and corporate credit spreads rose. Next, the riskier parts of the stock market, favored in 2017 and 2018, lost ground to safer segments of the market. Financial conditions began to tighten especially in Asia and Europe where concerns over trade were greatest. Commodity prices softened, reflecting lower expected global demand for industrial metals and energy inputs. By early fall, we saw weakening in domestic capital goods orders, Chinese manufacturing, and confidence indicators in Europe. Most recently, the earnings outlook for U.S. multinationals have been sharply cut by analysts. The evidence above supports a more gradual policy response from the Fed. The Federal Open Market Committee has come around to recognize this, and we feel the Chairman delivered the right message to the markets last week. While the policy shift could help lay the groundwork for an eventual turn, we are not yet at a point where the data points to clear skies ahead. Therefore, we continue to trim equity exposure in keeping with the direction of our WCA Fundamental Conditions Barometer (chart, above). Equity exposure in the short-term satellite portion of CONQUEST portfolios stand near 30%, with bonds at 70%. We continue to like domestic stocks over foreign, given the better performance of the U.S. economy compared to foreign.